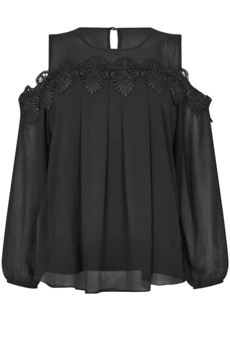 Iska London Cold-Shoulder Chiffon top will give your wardrobe an up-to-date chic makeover. Made from fluid chiffon semi-sheer fabric, this blouse features round neck, loose fit by design, lace border across shoulders and elasticated cuffs. Has teardrop cut with faux pearl button at the back, it is partially lined, and is approx. 62cm in length. Winter collection. Composition: 100% Polyester. Color: Black.